Scramblers have always been an interesting sub-category of retro-classic motorcycles. Light, simple and fun. So it wasn't surprising that Triumph included one in the new generation family of its Bonneville range of retro-classics, just like its previous generations. 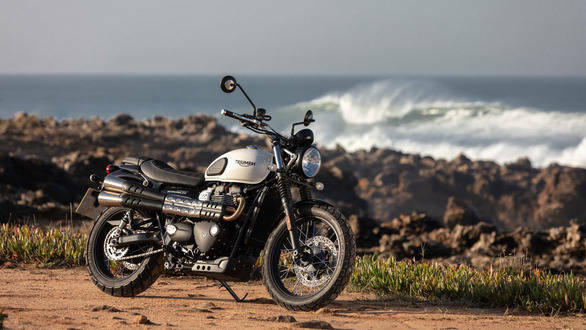 Launched in India in 2017, the Triumph Street Scrambler proved to be a fun machine, powered by the same, 900cc, parallel-twin engine as the Street Twin. It gets a host of mechanical updates for 2019. We spent a few hours in its saddle, riding it in the hills around Lisbon, the capital city of Portugal. Read on to know what it is like to ride. The Triumph Street Scrambler is a member of the British bike maker's current generation family of retro-classic motorcycles. The 'Scrambler' has been a part of the Bonneville family since 1963 in fact. It shares its 900cc, liquid-cooled parallel-twin engine and five-speed gearbox with the Street Twin, but the chassis differs slightly as the main frame is not exactly the same. The bike is also taller courtesy the longer fork legs, though suspension travel is the same as the Street Twin at 120mm. The fact that it is taller also makes it visually slimmer, which goes well with the fact that it is pegged as a bike that's also capable of light off-roading. The bike went on sale just two years back but has received a rather comprehensive mid-life update. The biggest news is the improved engine performance from the engine. Power output is up by an impressive 18 percent and stands at 65PS now as opposed to 55PS earlier. The rev range has been upped by 500rpm too and the engine redlines at 7,500rpm now. 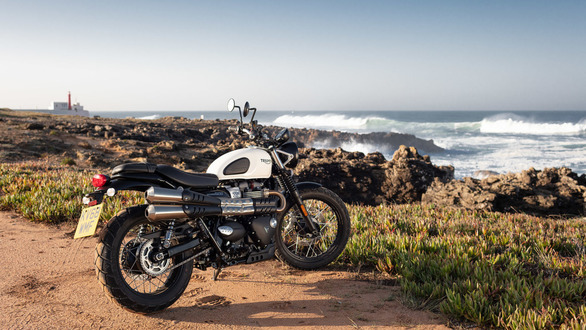 Triumph says customer feedback indicated that while they were quite happy with the bottom end and midrange grunt, a lot of owners wanted better grunt at the top. So the torque curve has been flattened  peak torque produced is the same at 80Nm but is now available from just 3,200rpm and is available for longer, which means better midrange and top end performance. The engine also gets a new magnesium cam cover, new lightweight crankshaft, dead shafts, and balance shafts. The clutch itself is lighter while the clutch cover is mass optimized. While the Street Scrambler did come equipped with traction control and ride by wire right from the start, the bike also gets riding modes now. It benefits from the addition of Rain, Road, and an Off-road mode. Throttle maps and traction control settings are adjusted in Rain and Road mode but you cannot alter TC settings manually though it can be turned off. The Off-road mode can be selected only when stationary and turns traction control and ABS on the rear wheel off to offer better rideability off the tarmac. For 2019 the Street Scrambler also comes equipped with 41mm cartridge forks from KYB with 120mm travel (same travel as the Street Twin) to improve stability and handling. Brakes have been updated as well  a new, four-piston caliper (with Brembo branding) has been employed upfront, for better brake feel and bite as well. Aesthetically, the bike remains largely unchanged except for changes like a revised seat cover for a more rugged look and revised logo. 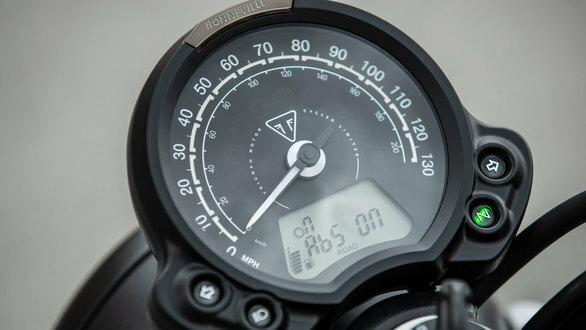 The instrument cluster remains the same, integrating the digital display at the bottom but gets slightly revised design a new bezel and graphics. 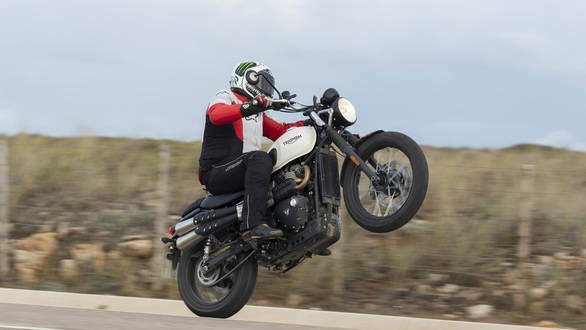 The 2019 Street Scrambler feels quick off the line, just like before, but the bigger news is the improved midrange and top end grunt. The engine pulls harder and quicker now, which makes for better acceleration. The lighter engine parts also help it rev quicker while throttle response is crisp and precise. In fact, I was really impressed with the throttle response  it makes riding the bike a delight, especially around corners as you know exactly what will happen with even the slightest twist of the wrist, instantly. The exhaust note from the twin, side-mounted silencers is as pleasing as before, emanating what Triumph likes to call the 'classic British twin sound'. Riding through the tiny towns and villages dotting Portugal's scenic landscape just outside the capital city of Lisbon was interesting to say the least, thanks to the strong engine performance at all times. The lighter clutch helped matters as well, reducing effort. Gear changes were precise though I wish the effort required to shift was lesser, as the gearbox has a slightly clunky feel. I didn't really need to switch to Rain mode even though the roads were wet almost all through the day, as the bike felt confident enough even in Road mode. Of course, I had to be cautious around corners, though admittedly traction control did take care of the rear end rather well. 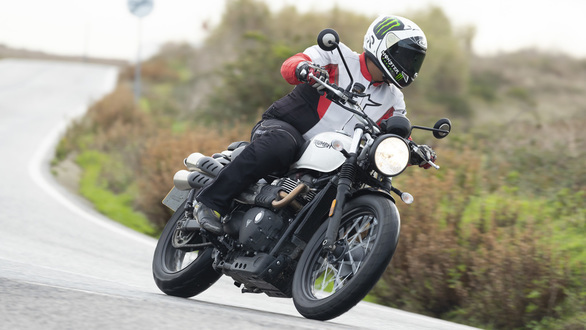 Handling has improved as well  front end feel and stability are better courtesy the new forks, as the Street Scrambler felt more confident diving into corners and also stayed well planted when leaned over, even on the cold, damp asphalt. 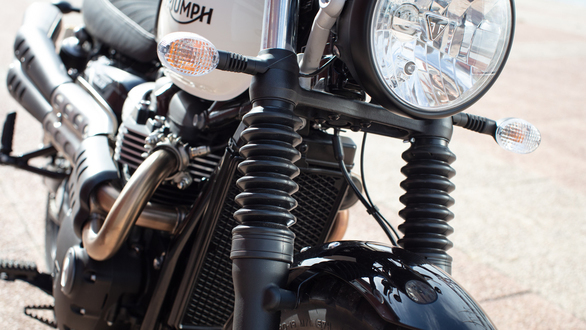 Triumph claims the suspension has also been made slightly more pliant. It did feel firm going over larger bumps and potholes at slow speeds, but ride quality at higher speeds felt better noticeably. 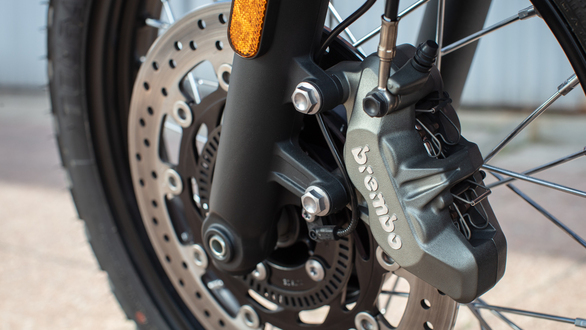 The updated Brembo brakes offer better braking prowess through a safer, surer feel and I have to say, I felt confident even when grabbing a fistful of the front brake lever. ABS worked well without being too intrusive too. I would have liked the Street Scrambler to shed some weight but overall weight hasn't changed  dry weight is 203kg, which is still high. Not that you feel the weight on the go, it's just that the bike feels a tad heavy when stationary or when maneuvering it around. 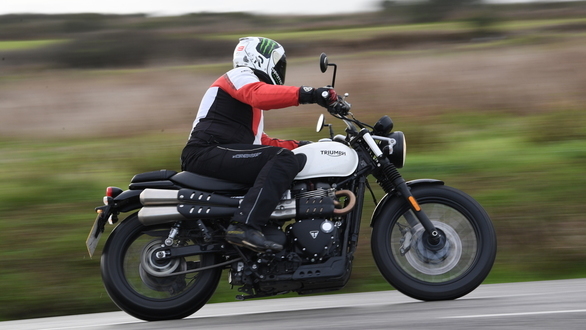 The Triumph Street Scrambler was always an interesting addition to the Bonneville family and feels more competent now. 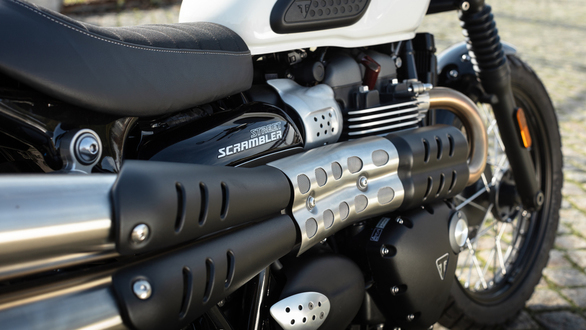 The improved performance and handling are both welcome and further sweeten the package that the Street Scrambler is. Build quality and fit-finish have always been excellent, and that's something that hasn't changed. 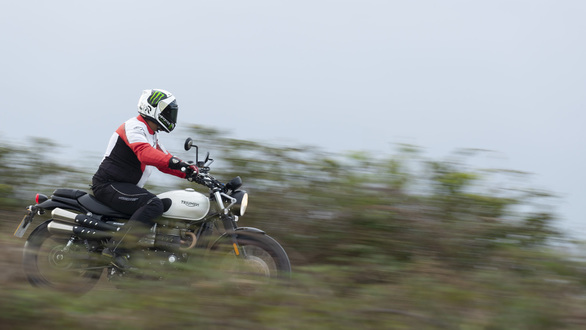 It should feel even more competent now against its arch-rival, the Ducati Scrambler Desert Sled, as the Triumph is certainly smaller and friendlier to ride. The current version is priced at Rs 8.60 lakh ex-showroom in India and I expect the updated version to cost in the same region, thus helping it offer better value for money.